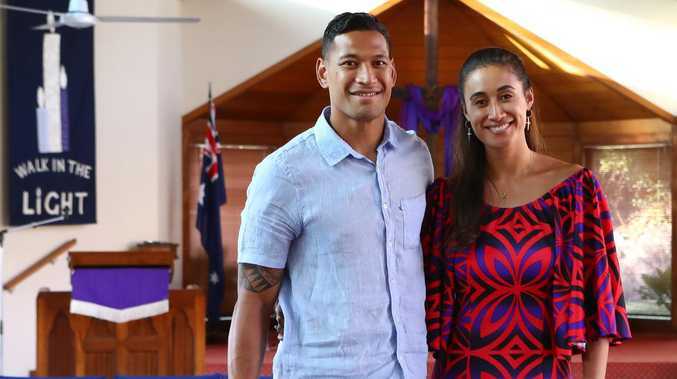 Israel Folau with his wife Maria Folau at Kenthurst Uniting Church after a Sunday service. GEELONG champion Gary Ablett and Carlton midfielder Matt Kennedy have been embroiled in the Instagram scandal that is set to end Israel Folau's rugby career as Wallabies coach Michael Cheika and captain Michael Hooper weighed in on the furore. 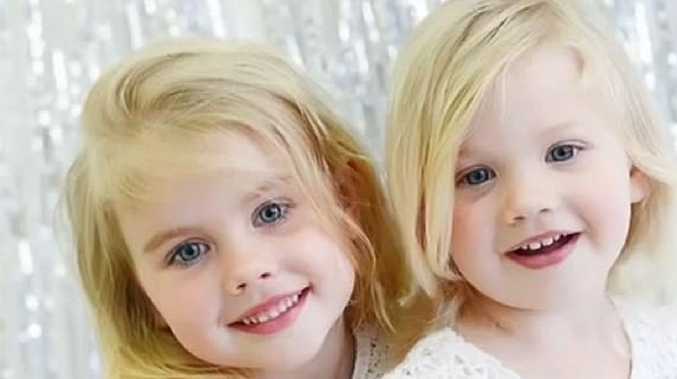 Ablett and Kennedy were two of nearly 39,000 people who liked Folau's controversial homophobic post which said gay people are going to hell unless they repent. The Herald Sun reports that Ablett removed his like on Sunday, with the Cats unaware of his interaction with Folau's post. The dual Brownlow medallist is a devout Christian who has been active on Instagram with his religious beliefs in the past, as well as open with the media throughout the second half of his illustrious career. Ablett prayed before games during his time at the Gold Coast Suns, along with Aaron Hall and Zac Smith. Former Giant Kennedy is also a practicing catholic. Wallabies players Samu Kerevi and Allan Alaalatoa also liked Folau's post. Cheika and Hooper both addressed the media about Folau's scandal on Monday. Cheika confirmed he won't pick Folau again and revealed he is yet to speak to the 30-year-old about the storm, but has left messages with him. The coach also said Folau has "crossed the line" after being involved in previous discussions where it was made clear his homophobic rants on social media were not acceptable. "We've had the discussion about it after the last time about his right to believe and our support in that ... but getting out in that disrespectful manner publicly, is not what our team's about," Cheika said. "When you play in the gold jersey, we're representing everyone in Australia. "I felt that I needed to talk to him (Folau) about why but I haven't had that chance as yet." Cheika emphasised the importance of the team but also said "everybody has the right to believe (in what they want) and we respect that right. We're not moral judges and no one should be". Hooper said "love" is one of the core values of the Wallabies, both on and off the field, and said it was "frustrating" he had to talk about this latest controversy. He said the Wallabies stand for appreciating diversity "in a respecful manner". It comes as Folau says it will be "God's will" if his rugby career is ended over his comments that gay people will go to hell unless they repent. 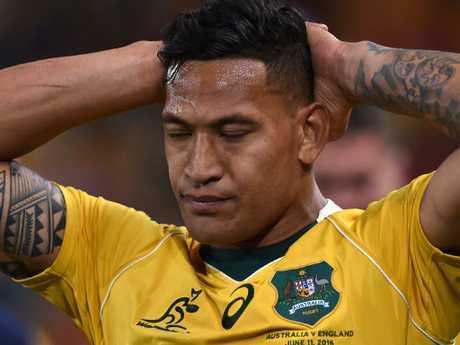 Rugby Australia has indicated it will terminate Folau's contract unless he can cite "compelling mitigating circumstances" for his latest social media post in which he said hell awaits "drunks, homosexuals, adulterers, liars, fornicators, thieves, atheists, idolaters." A devout Christian, Folau had previously been warned but had not been sanctioned for similar comments. In his first interview since Rugby Australia announced its intention to terminate his Wallabies and Super Rugby contracts, Folau told the Sydney Morning Herald on Sunday he will walk away from rugby and his multi-million dollar income if God wills it. Rugby Australia is expected on Monday to notify Folau he is in breach of his contract, starting the formal disciplinary process which could lead to his sacking. The Sydney Morning Herald interviewed Folau after he had attended a church service in western Sydney on Sunday at which speakers praised his comments and said he isbeing persecuted for his faith. "First and foremost, I live for God now," Folau said. "Whatever He wants me to do, I believe His plans for me are better than whatever I can think. "If that's not to continue on playing, so be it. In saying that, obviously I love playing footy and if it goes down that path I'll definitely miss it. But my faith in Jesus Christ is what comes first." Folau, 30, said he had no intention of retracting or apologizing for his comments about gay people which, he insisted were based on his Christian beliefs. On Wednesday night Folau posted to his Instagram account that: "hell awaits drunks, homosexuals, adulterers, liars, fornicators, thieves, atheists and idolators" - adding they should "repent". Israel Folau on the field for the Wallabies. When confronted with the issue of whether he felt his comments on sinners, specifically the gay community - that he alluded to in this week's social media post - and ones he made in the past were something he would like to reconsider, Folau doubled down and backed his views. "I'll stand on what the Bible says. I share it with love. I can see the other side of the coin where people's reactions are the total opposite to how I'm sharing it. "But in Ezekiel, chapter 33, verse 11, it says that 'God has no pleasure in the person that's living in sin' - He's a loving God and he wants people to turn away from what they're living in and he'll give them life. "That's the message that I'm trying to share, even though it comes across as harsh. I can't change what the word of God says." Despite a large amount of criticism being directed at him Folau said he has the support of his church family and that he does not bare any ill will to those who have delivered harsh comments towards him in the past week. "Obviously it's a tough time but for me I find comfort in obviously what the Bible says," Folau said. 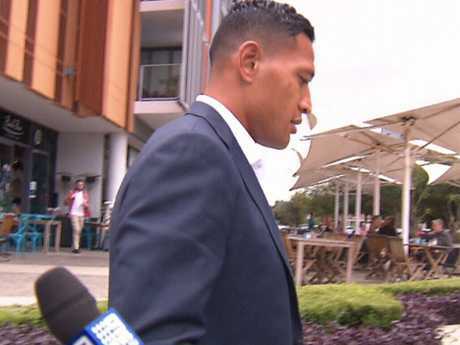 Supported by his professional netballer wife Maria, the three-time John Eales Medallist Folau spent Friday morning at a Sydney cafe with Rugby Union Players' Association boss Prataal Raj and another RUPA representative plotting his next move. "Our joint position regarding Israel Folau is unchanged," it said. "Following today's meeting, the two organisations will update their respective boards on the matter to consider next steps." Beyond his fierce commitment to his faith, it remains a mystery as to what had motivated Folau to continue his social media outbursts after being warned last year to express his views in a "respectful" manner. Beattie said the former Test and State of Origin rugby league star "fails the NRL's inclusiveness culture".